Looking for a fun new recipe idea for your next brunch? Why not try our wonderful Vanilla-Cinnamon French Toast Blossoms! 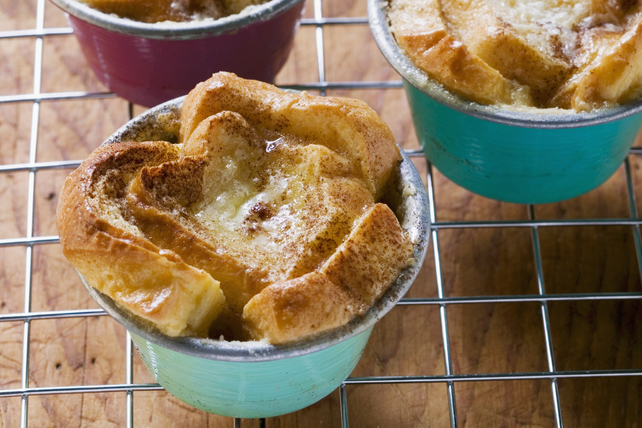 These single-serve French toast cups are assembled the night before, so all you need to do is pop them in the oven the morning of your brunch. Spray 8 (150-mL) ramenkins with cooking spray. Cut each of 8 bread slices into thirds. Stand 3 bread pieces, with edges overlapping, in each prepared ramekin to resemble flower petals as shown in photo. Cut each of the 2 remaining bread slices into 4 pieces. Stand 1 bread piece in centre of each ramekin. Whisk eggs, milk, dry pudding mix and 1/4 tsp. cinnamon until blended; pour over bread. Heat oven to 375°F. Place ramekins on rimmed baking sheet. Bake 35 min. or until knife inserted in centres comes out clean and and tops are golden brown. Sift 1 tsp. icing sugar evenly over tops of desserts before serving. Drizzle with warmed maple syrup before serving with fresh fruit. These fun desserts can be refrigerated up to 24 hours before baking as directed.